Papa's gone and we are on our own... This Grateful Dead related T-Shirt pays tribute to Jerry Garcia. 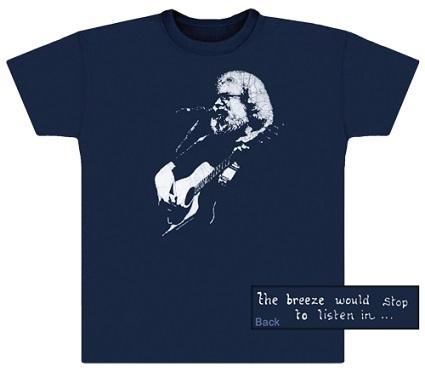 It has a batik style image of Jerry on the front playing an acoustic guitar, and the back of the t-shirt is printed with the words "the breeze would stop to listen in...". Screen printed on a navy 4 1/2 oz. combed ring spun cotton, super soft style T-shirt. Officially licensed by the Grateful Dead, and the estate of Jerry Garcia.